Do you feel like freedom and financial liberty is not within reach? By understanding the concepts of the Cashflow Quadrant, you can learn the principals of income and how money is actually generated. Once you grasp this understanding, you’ll have a better idea of how you can achieve your desired financial security. Robert Kiyosaki created the Cashflow Quadrant so that you can better understand how to take control of your financial future. You do this by understanding each of the four quadrants by which you can earn income, as well as the long term results typically associated with each Cash Flow quadrant. Before I get into how the CashFlow quadrant can help you change your life, what the heck is it? 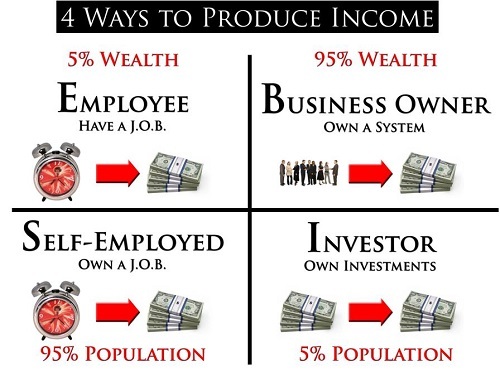 It’s a way of understanding your source of income, as illustrated by these four quadrants: E,S,B, and I. The majority of people are employees. You work for someone and get paid based on your time. You don’t have much leverage in the Cashflow employee quadrant because you are trading time for money. There are only so many hours you can actually work. Although you may feel more secure being an employee, time and money freedom will always be out of reach by staying in this quadant. Working for yourself sounds great, but it’s a lot like being employed. According to the Cashflow Quadrant model, the “S” is also on the left side of the quadrant where just 5% of wealth is created. Being self-employed is also a trade-off. If you have a paying project to work on and you do it, you get paid. If you have no project next week, you don’t make any money. There are no residual monetary rewards from being self-employed. You are still trading time for money. Being a business owner puts you on the right side of the Cashflow quadrant where you get rewarded not only for your own efforts, but the work of other people too! I like that already! Network marketing is a good example of being a business owner. You build a team of people who all do a little or a lot, and you earn income from their efforts as well. Being an investor is not like being employed or even a business owner. The investor quadrant people make decisions about where to invest their money to get the most income back. If you invest your money into the right growth businesses, you don’t really have to anything at all except collect your income! Where do you fall in the Cashflow Quadrant? That is your first step to financial freedom. If you are entirely on the left side, your chances of financial freedom are quite slim. When you depend entirely on active income, you are always trading time for money. Unless you have a 100 hours a day that you can trade for a good rate, financial gain may always be out of reach. If this is you, identify where in the Cashflow Quadrant you need to be to get what you want in life. The right side of the quadrant is all about passive income or residual income. For example, you don’t have to work one hour to earn income. If you are a business owner, income is being generated by other people even when you are not present. If you are an investor, the same holds true. It’s called making money while you sleep. Yeah! I like being on the right side of the quadrant! What if you could work hard for a few years to create a passive income for life? Would you do it? Becoming a business owner is something you can do while you are still an employee. Move yourself from the left active side of the Cashflow Quadrant, to the right passive side of the quadrant. As your business or investments grow, you can create an exit plan from being employed. It may take some time. But would you rather spend a few short years working hard for a lifetime of financial freedom or, spend a lifetime working hard for no financial freedom? Where are you in the Cashflow quadrant? Leave a comment! PS If you are looking to build a business online and create passive income, check out this free video that shows you how to leverage the Internet to build any business online. B & I. I have money invested working passively, while I also run my business systems. 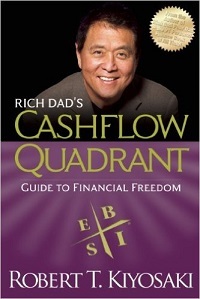 I love Robert Kiyosaki and the cash flow quadrant! Great blog! Great post on the cash flow quadrant. I read Robert Kiyosaki’s Rich Dad Poor Dad where he talked about it and it really inspired me to look for other avenues to generate cashflow.